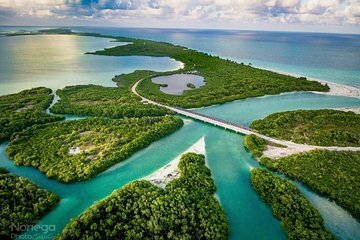 Travel on a marine safari through the Sian Ka'an reserve, a UNESCO World Heritage Site, on this all-day guided tour from Playa del Carmen. Ride through its lush jungle before boarding a boat, from which you’ll be able to spot turtles, stingrays, manatees, dolphins, and different seabird species. Plus, snorkel around the Great Mayan Reef and take a dip in Punta Allen's natural pool.